I love purchasing these cheap little bow sets. They are so tacky and yet can be incorporated into an overall look that is very elegant. This particular package is a bit different from the bow in my example, but it came from a cheap set like this that I bought at the dollar store. I really like the “mesh netting” I used in the example below and am always on the look out for this particular style. The ones above work in much the same way, just a bit different look. These little boxes were purchased as a set (of 2 or 4?) from the dollar store. I made the matching gift cards with a snowflake stamp and white ink on matching blue paper that I cut into circles. I added a button brad to the center and a few dots of glitter glue to add a bit of sparkle. 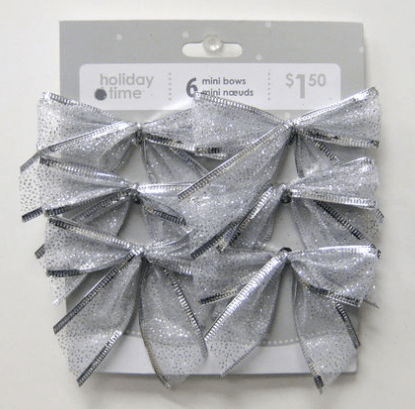 The embellishment on top consists of one of the dollar store mesh bows, opalescent shreds, basic white curly ribbon and a 6 -8 inch strand of wire holly garland twisted to give the look added dimension. The above shots are all of the same gift, just different angles. I love the little flap on the dollar store box that also has a snowflake on it. So cute, for so little! Posted on December 10, 2013 by Cindy Roy •	This entry was posted in All Things Christmas! and tagged Christmas gift wrapping, creating beautiful gifts on a budget, gift wrapping ideas. Bookmark the permalink.